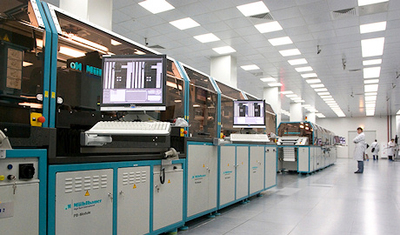 The first 10 million chip cards for access to supply in 2010 in China Russian factory "Micron". Domestic RFID-chips can compete with the Chinese on the "price-quality", I'm sure the manufacturer. The included concern "Sitronics" factory "Micron" began to supply China with RFID-chips issued at 180 nm technology on 200-mm wafers. Until the end of 2010 under the signed contracts with Chinese manufacturers of electronic maps and system integrators, the company expects to deliver 10 million chips. In cooperation with the countries of Southeast Asia to the Russian manufacturer is nothing new, the basis of its exports to the region for the past 20 years are analog power management. However, RFID chips for "Micron" delivers the first time. According to the "Micron", the company is able to compete with Asian manufacturers in terms of price and quality. "Effective cost provided design solutions aimed at reducing the chip area and a good yield ratio" — explained CNews Karina Abagyan, head of marketing, "Micron". The final products created based chips "Micron" in China, will be the access card — electronic keys for homes, offices and hotels. The company expects to promote their products among manufacturers of cards due to the existing customer base and business relationships in the region. Selling to China's own finished products at the "Micron" does not work: because of customs and logistics costs local assembly becomes profitable. "Micron" trade with China only through their own representative offices in Shenzhen, Hong Kong and Taipei. In absolute terms, in 2009 revenue, "Micron" export chips fell, said Abagyan. But in 2010, the figure "undoubtedly grow," she said. Capacity to manufacture 180-nm chips appeared in "Micron" in the 2007 cost of the equipment was estimated at 6.5 billion rubles. The share of RFID-chips in total revenue, "Micron", according to Karina Abagyan, exceeds 30%. Plant "Micron" is a business segment of "Microelectronics", which also consolidated the financial results of your smart cards "Sistroniks Smart Technology." Total revenue for the direction of IFRS for 2009 was $ 208.1 million, of which 15-20% was for export sales RFID-products — 35%. The cost of chips shipped to China in the "Micron" is not open. "Judging by the description, I mean single-channel electrically programmable memory of small volume, which all over the world are produced on the old micron and submicron technology is not, and is worth in the region of 6 cents per chip," — says Alexey Tabolkin, general director of "Angstrom" . "Angstrom", he said, also supply to South East Asia RFID crystals on the plates, and the crystals in LCD and LED-drivers, power management schemes batteries for mobile phones and other electronics. Recall that for the purchase of equipment and technology for the production of AMD chips in the topology of 130 nm, "Angstrom-T" took loan from Vnesheconombank in the amount of 815 million euros (received was less than half of that money), but the equipment has not been imported into the country. Tabolkin also suggests that Chinese interest in the Russian crystals on the plates can be caused by a desire to resell RFID tags on foreign markets. "Major manufacturers from the U.S. and Europe do not really want to supply your plate in China — he says. — From Crystal Chinese do RFID-tags and sell them back to Europe and the United States, thereby increasing competition in the market. It is clear that European and U.S. manufacturers do not like it. "